The online art market plods on with steady growth. 2018 was not a game changing year and we wait to see where the consolidation and casualties will be in a market place that clearly remains overcrowded. Perhaps the penny is starting to drop as the confidence level about the future amongst online platforms has dropped significantly this year. In any event business plans and credit lines will be stretched to breaking point as most will have planned on the online art market getting traction and significant market share much quicker. Blockchain has been much talked about, often incomprehensibly, and has proved to be a bit of a damp squib. Clearly it has potential to help with provenance, authenticity and condition reports but on the other hand it isn’t the panacea to all our troubles. We continue to love working with the art market whether it is insuring, sponsoring or buying art, and we hope this report brings a little more clarity to a notoriously opaque market. Whilst the online art market has been riding on the back of an overall art market boom since the financial crisis in 2009, global economic and political uncertainty is expected to test the resilience of online art buyers in 2019. Although 77% of the online platforms surveyed feel positively about the online art market in the coming 12 months, this is down significantly from 96% in 2018. This could be linked to the fact that 71% of the online platforms said they expected more consolidation among online art platforms in the coming 12 months. Instagram continues to be the art world’s favoured social media platform, with 65% of survey respondents choosing it as their preferred social media for art related purposes, up from 63% in 2018. 55% of the online art buyers surveyed said they were likely to buy more art over the next 12 months, up from 52% in 2018, however, the outlook among younger art buyers (aged 35 and below) is more muted year-on-year, with 56% saying they were likely to buy more art online, compared to 63% in 2018. 29% of millennial art buyers said they preferred buying art online, compared to 14% a year ago. More millennials bought art online in the last 12 months, and 79% said they had bought more than once (up from 64% last year). In addition, 23% of millennials said they had never bought an art work in a physical space (e.g. gallery, auction or art fair) prior to buying art online, up from 18% last year. General retail e-commerce grew an estimated 21.6% in 2018, and online spending habits are also benefiting the online art trade, with 73% of art buyers saying they purchased other products in a similar price range prior to buying art online, up from 68% last year. Despite the hype and early promises of blockchain’s ability to cure many of the art market’s ills, the initial bubble seems to have deflated. Although the technology is here to stay and will further evolve, the majority of the art world remains on the fence and waits to see how this pans out. Provenance tracking and ownership-registry remains the most relevant user-case for blockchain in the art market at the moment. Half of the online platforms said that a title / ownership registry for the art and collectibles market would be the most likely area where blockchain technology would succeed. Could fractional ownership be an entry point for young buyers who want to invest in the art market? 51% of art buyers surveyed under the age of 30 said they would consider fractional ownership of art as a form of investment. 43% of new art buyers (those to have been collecting art for less than three years) also showed an appetite for fractional art ownership. Sotheby’s acquired Viyet.com, an online marketplace for vintage and antique furniture and decorative objects. The Artling launched an app with a custom-built augmented reality feature allowing users to view the artworks in real-time in their space. Sotheby’s brought back fees for online-only auctions. LiveAuctioneers partnered with Codex to present a groundbreaking auction of crypto-theme art. Gagosian launched its own temporary, high-end online salesroom. Teamlab and Mori Building launched Mori Building Digital Art Museum in Tokyo. Christie’s hosted the first art and technology summit, dedicated to blockchain, co-organised by the online art platform, Vastari. Masterworks, co-founded by serial entrepreneur Scott Lynn, announced its blockchain-based stock trading platform for significant works of art. Justin Bieber’s manager, Scooter Braun, invested in an art start-up that targets millennial collectors. Phoenix Art Museum presented first-ever virtual reality exhibition. Maecenas tokenised a multi-million Dollar artwork; Andy Warhol’s ‘14 Small Electric Chairs (1980)’. The beta public sale raised $1.7 million for 31.5% of the artwork valued at $5.6 million. Barnebys acquired online valuation firm ValueMyStuff. Shirtless statue of Pope Benedict by Jago sold in shares to the crowd and placed in a public art institution by Feral Horses. An artwork created by Paris-based art collective, Obvious, using artificial intelligence was sold at Christie’s auction house in New York for nearly half a million Dollars. Christie’s collaborated with blockchain title registry, Artory, for Barney A. Ebsworth Collection auction. Walmart announced its plans to acquire Art.com. Swarm added a new security token The Art Token (TAT) to its platform, which is regulated in Lichtenstein. Parisian art marketplace Singulart raised €1.5 million to further its international expansion. Starts Security Token Offering (STO) sold to accredited investors. ARTOPOLIE positioned itself as a new fractional ownership platform that allows the average person to invest as little as $50 towards works by Pablo Picasso and similar artists. The platform is set to officially launch in Miami at Art Basel 2019. Invaluable and Mearto formed partnership to offer online appraisals. Sotheby’s auction of the artificial intelligence artwork by Mario Klingemann. Artfintech.one. The first artist tokens were issued for a digital video by Dragos Alexandrescu. Artory, the blockchainbacked digital art registry, acquired Auction Club, a database of auction prices from 4,000 international auction houses. 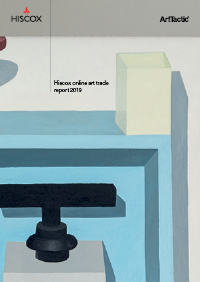 The Hiscox art market hub explores topics and themes that arise from the latest report and includes useful interviews, articles and analysis. We offer specialist home insurance, with policies tailored to your home and your needs, including art insurance up to £10,000 as standard. Get a home insurance quote.